In the distant dark of time and space the Skal’Potar were waging a war. Uncountable lives were lost. In the middle of the war, an ancient warrior appeared to challenge their king. His teeth flashed white, his hair curled like a thousand talons. The Skal’Potar’s king had made a weapon that became known as the Axe of Gilgamesh. It merged with the king’s mind and gave him power over matter – over life and death, and fuelled his lust for blood. The Doctor sipped his tea and thumbed the Time Ring in his pocket. Minutes earlier he had arrived in the back garden of an elderly lady, making a small crater in her flowerbed. He’d awoken to the smell of tea. “Yorkshire Gold!” His eyes snapped open. “You’re in my begonias.” The lady put the tea on the grass and wandered indoors gesturing to the Doctor to follow. “Is there?” His eyes widened. “Indulge me.” He grinned back at her. He joined her at the table. “It’s not important. Florence, we at the Air Force have lost something. 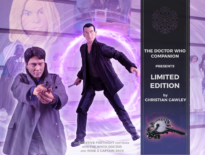 Something rather dangerous I’m afraid- a weapon.” The Doctor’s voice lowered. “The Axe of Gilgamesh. “Oh no. Sharp as a button me.” She gave him a wink. “‘Dear Puddin’”, the Doctor read. “He calls me that.” Florence blushed. “‘I’ll be home for Christmas! Just a week then I’ll have to go but I can’t say where.’” Florence couldn’t stop smiling. “You have some.” The Doctor gestured to the glow coming from the room. Florence frowned. “I’ve never had lights.” They walked to the living room. 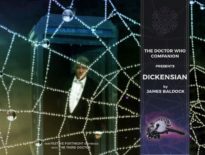 As the Doctor entered something snaked across the floor disappearing from sight. The glow from coloured lights around the fireplace began to pulse faintly. There was a quiet growling. They were attacked. What looked like Christmas lights around the fireplace began multiplying and snaking around the walls. They launched at the Doctor and pinned him to the floor wrapping his arms and legs in green wire and tiny lights. Florence walked slowly into the middle of the room gazing at the lights darting about the ceiling. A single tendril snaked down and hung menacingly inches from her face. She was transfixed. “Oh, isn’t it lovely.” She touched the light hovering just in front of her. 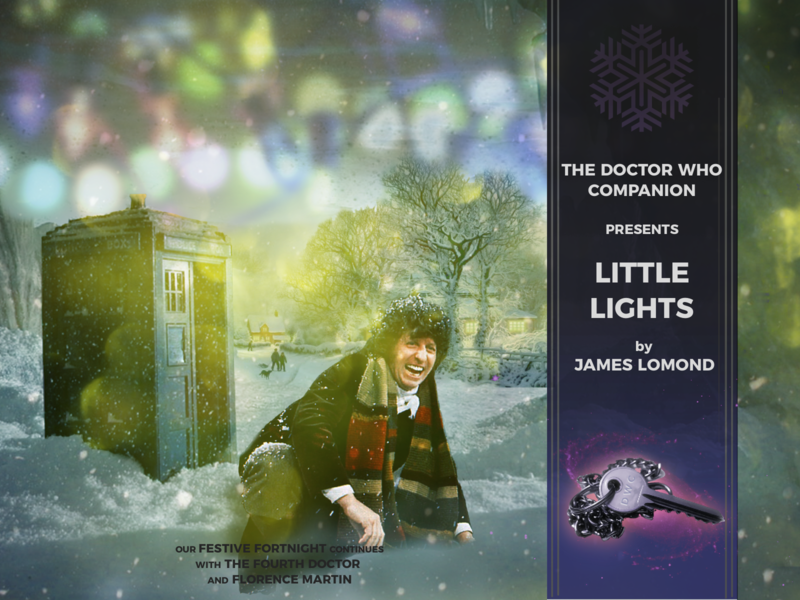 “Little lights, Doctor. Like people in their homes.” Florence touched the light and the growl changed to a quiet hum. The lights suddenly spread in a delicate web across the ceiling like an aerial view of cities at night. Florence looked at him. She had a tear in her eye. The host of the Axe of Gilgamesh is known by the Skal’Potar as the Skal-Fraeg of the Seventh Column – their most prestigious honour. One Skal-Fraeg was responsible for the longest peace time in history, and she lives in Upper Fiddly. Every hundred years the Doctor would visit the Skal-Fraeg who now had an unusually long lifespan. She lived in her cottage and used her powers for fixing fences, mending clothes and little healing here and there. She couldn’t remember how she came by her powers or where Harry was, but she knew somehow that he was with her. Once a year at Christmas the village children would come to her cottage. They’d listen to stories about the Doctor and when the sun went down, they’d look up at her ceiling and watch the little lights. 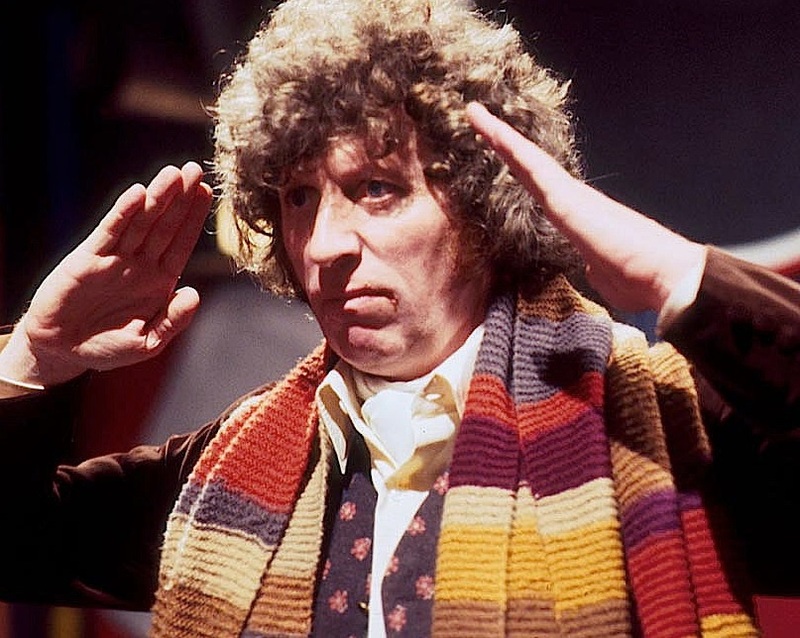 ← Why Was the Doctor Who Companion Down Today?